So, not all bad, but we can’t just assume that trying to flash a firmware is a safe thing to do for all drives. 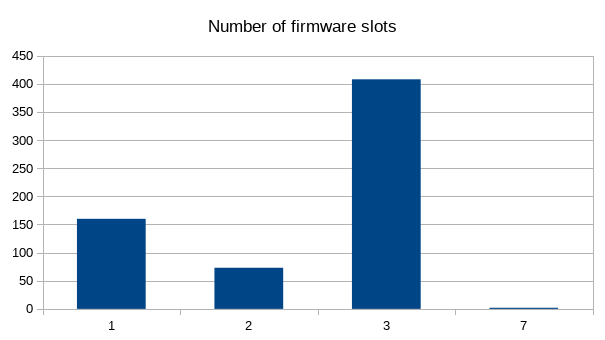 The next, much bigger problem was trying to identify which drives should be flashed with a specific firmware. You’d think this would be a simple problem, where the existing firmware version would be stored in the “fr” firmware revision string and the model name would be stored in the “mn” string. Alas, only Lenovo and Apple store a sane semver like 1.2.3, other vendors seem to encode the firmware revision using as-yet-unknown methods. Helpfully, the model name alone isn’t all we need to identify the firmware to flash as different drives can have different firmware for the laptop OEM without changing the mn or fr. For this I think we need to look into the elusive “vs” vendor-defined block which was the reason I was asking for the binary dump of the CNS rather than the nvme -H or nvme -o json output. The vendor block isn’t formally defined as part of the NVMe specification and the ODM (and maybe the OEM?) can use this however they want. 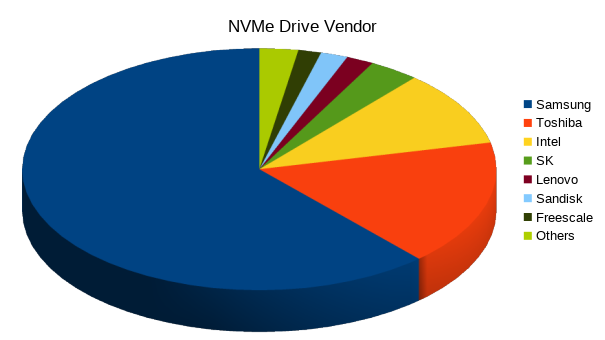 Only 137 out of the supplied ~650 NVMe CNS blobs contained vendor data. SK hynix drives contain an interesting-looking string of something like KX0WMJ6KS0760T6G01H0, but I have no idea how to parse that. Seagate has simply 2002. Liteon has a string like TW01345GLOH006BN05SXA04. 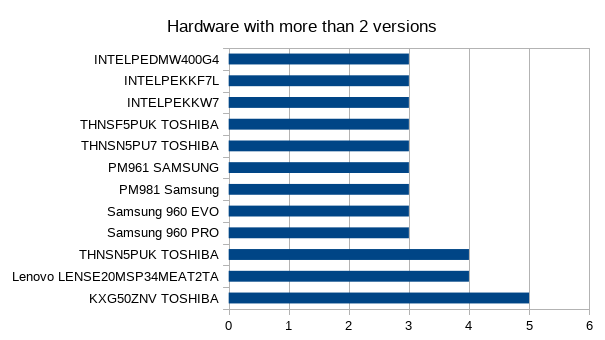 Some Samsung drives have things like KR0N5WKK0184166K007HB0 and CN08Y4V9SSX0087702TSA0 – the same format as Toshiba CN08D5HTTBE006BEC2K1A0 but it’s weird that the blob is all ASCII – I was somewhat hoping for a packed GUID in the sea of NULs. They do have some common sub-sections, so if you know what these are please let me know! I’ve built a fwupd plugin that should be able to update firmware on NVMe drives, but it’s 100% untested. I’m going to use the leftover donation money for the LVFS to buy various types of NVMe hardware that I can flash with different firmware images and not cry if all the data gets wiped or the device get bricked. I’ve already emailed my contact at Samsung and fingers crossed something nice happens. I’ll do the same with Toshiba and Lenovo next week. I’ll also update this blog post next week with the latest numbers, so if you upload your data now it’s still useful. Original article title: Richard Hughes: Adventures with NVMe, part 2. This full article can be read at: Richard Hughes: Adventures with NVMe, part 2.